The big reveal! Historiann has a face for C-SPAN 3. You can see me lecturing to my HIST 358: American Women’s History to 1800 students from this semester on the politics of early American women’s underwear (srsly!) on C-SPAN 3, American History TV, this weekend. I’m on Saturday 8 p.m. EST/6 p.m. MST, again on Saturday at midnight/10 p.m., and Sunday at 1 p.m./11 a.m. If (like me) you don’t get C-SPAN 3, it streams online over the weekend, too. I also throw in some bits about the 600-year old bra, John Paul Gaultier, and Madonna into the lecture, just for laughs. How did I get interested in early American undergarments, and why on earth do I think this is an appropriate subject for an undergraduate student lecture? I’ve always had a personal interest in clothing and fashion, and wrote both an article and a chapter in Abraham in Arms on the stripping and redressing of war captives of Indians and the many meanings of the exchange of clothing between English and Native peoples in the colonial northeast. In researching my current book, which is in large part about a child (Esther Wheelwright, 1696-1780) whose life is largely undocumented by traditional historical sources, I decided that thinking about her bodily experiences through the material culture of early American childhood was perhaps one way to think about her life. Young children are very in touch with their bodies’ immediate needs, and the first half of my book follows Wheelwright from age 7 to 14: what did she eat? Was she hungry? Where did she sleep, and with whom? What would a Catholic Mass have looked, sounded, and smelled like to her? And above all, what was she wearing as she crossed from an English garrison to a Wabanaki village, and from the Wabanaki village into the Ursuline convent school in Quebec? My investigations of material culture made me think that my students might be interested in and benefit from the same exercise, so I added this lecture to my women’s history course and my colonial North America course. This lecture is in fact an illustration of how a professor’s research interests directly enrich her teaching and benefit her students. A note on the “classroom” in which we were recorded: it’s not the real deal. Our classroom was a charmless, windowless, yellow-painted cement block hellscape, freezing cold year-round (which I will admit is better than hot, and I’ve worked those rooms too), whose internet connection just fritzed out inexplicably less than halfway through the term. That’s the kind of pull we lazy, coasting tenured radicals have in Colorado. What you’ll see on the teevee ain’t exactly glamorous, but it is a room that’s been rehabbed sometime since I graduated from college. But, my classroom had three things going for it: location, location, and location. It is about 60 steps from my office, and especially convenient when teaching there in January and February. And much as I hate to say it, it’s not the worst classroom I’ve ever been assigned! Borque, Bruce J. and Laureen A. Labar. Uncommon Threads: Wabanaki Textiles, Clothing, and Costume. Augusta: Maine State Museum, 2009. Brown, Kathleen M. Foul Bodies: Cleanliness in Early America. New Haven, Conn.: Yale University Press, 2009. Miller, Marla R. The Needle’s Eye: Women and Work in the Age of Revolution. Amherst: University of Massachusetts Press, 2006. Morgan, Jennifer L. Laboring Women: Reproduction and Gender in New World Slavery. Philadelphia: University of Pennsylvania Press, 2004. Baumgarten, Linda. Eighteenth Century Clothing at Williamsburg. Williamsburg, VA: Colonial Williamsburg Foundation, 2004. 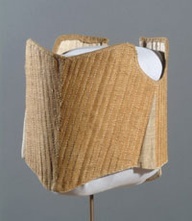 –What Clothes Reveal: the Language of Clothing in Colonial and Federal America: the Colonial Williamsburg Collection. Williamsburg, VA: Colonial Williamsburg Foundation, 2002. Baumgarten, Linda and John Watson with Florine Carr. 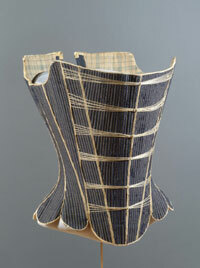 Costume Close-Up: Clothing Construction and Pattern, 1750-1790. Williamsburg, VA: Colonial Williamsburg Foundation, 1999. ← Happy holiday post, with cookies. Oh, how exciting! I can’t wait to see it in a quiet moment! Historiann, do you know if the show will be archived? Or is it only available when it airs on schedule? You mean I know a real teevee star? Cool! I’ll have to see if I can stream it, here. When I was a grad student, I was a popular guest lecturer due to my hobby of historical recreation. There’s nothing like coming into a class in full Renaissance dress and stripping down to corset and kirtle, using the various items to talk about the cultural history of so many aspects of historical life such as colour, textiles, fashion and household chores. ditto on the archive question. This sounds like a not-to-miss, but not sure if I can get to a flatscreen during those times. And if so, it will probably be carrying the Post-Toasties Holliday Flake Bowl from Jacquaranda Springs, MO. Hurray! Thank goodness I will have all my Christmas baking done. Nothing like eating cookies when someone else is talking corsets. Congratulations to you! And thanks for the holiday present! Now that’s a spammy sanitary napkin belt, at 12:31pm…. Yes, indeed–that was superspam. Ick. Thanks for all of your interest and congratulations. I will check to see if it will be archived–their website has a number of podcasts of previous lectures, so mine might be after it airs. Historiann on the motherfucken teevee! Katherine–I’d love to hear about your AHA paper. (Are you writing about the 600-y.o. bra???) Maybe we can finally get together next week? Let me know your whereabouts via email, if you’re interested. Channel 169, Lectures in History, “Colonial Women”, 6:01 – 6:41 pm, repeating 10:01 – 10:41 pm. Thanks, cgeye–maybe I can get that after all. I got home in time to catch the latter half of the lecture live streaming. I watched it with one of the eight year olds who lives here. He pointed out that most of your students were women and that women asked all of the questions. I asked if he wanted me to enquire about that and he replied: no. I will try to catch the first half on the repeat airing. After the lecture my young companion and I talked about what kinds of regularizing or classifying clothing we know about. It came down to school uniforms, which we think could have positive and negative attributes. The positive is economic ambiguity among students and the negative is power hierarchy in the classroom and school. Great lecture Historiann! Gave me lots to think about for my earlier period, raised lots of questions that I can’t wait to talk to you about. Thanks! The fam and I loved it! Rachel, I think one member of your family has already seen a version of this lecture, IIRC. “The 600-year-old bra” sounds like the title of a horror movie. Historiann, I was sorry to have missed the original air time, but the lecture is still available on the c-span3 site, under “Recent events.” Click there; then find “Recent events on American HIstory TV” — at the bottom is a link to “more events.” Then scroll down to find “Stays and Colonial-Era Clothing.” I don’t know if it will remain available, but for those who, like me, missed the original airing, you still have a chance! Squadrato is exactly right–you can find the link to the page here. Just click under where is says “video playlist” on the right side of the page. He did Historiann…it was a bit frightening he knew what you were going to say before you even said it.